The Mahindra Group has decided that all new vehicle platforms, including light commercial vehicles (LCVs), coming from its stable will be architectured keeping in mind the requirements for electric variants. The move will make it easier for Mahindra to offer electric variants on all its new models, unlike now where it must reengineer and retrofit the electric drivetrains to existing models. “Going forward, it is not going to be an existing vehicle getting electrified. When a new platform is conceived in the Mahindra Group, it will start with an ‘electric as an option’ at a very early design stage. This includes the light cargo vehicles,” said Mahesh Babu, CEO of Mahindra Electric. Mahindra is reaffirming its commitment to the electric vehicle segment in India as it sets it eyes on reaching the lofty goal of selling 100,000 of them by 2022. Further, the decision to change the way vehicles are being designed is being supplemented by the development of high-voltage drivetrains by group subsidiary Mahindra Electric. As part of its EV 2.0 plan Mahindra Electric is jointly working with SsangYong on 380 volt electric drivetrains which will be globally competitive. Vehicles using this system will have a range of over 250 km and offer performance comparable to gasoline-powered cars. The Korean company has already said it would use the drivetrains in building electric SUVs. “This will put us in the global league, it will be a globally competitive system which will meet all European, Korean, and Indian standards. The system will be high-power, high-performance, high-range and will be coming in around two years from now,” added Babu. Mahindra Electric is even working on drivetrains for electric buses, which the group’s commercial vehicle arm is exploring to use for building zero-emission city buses. 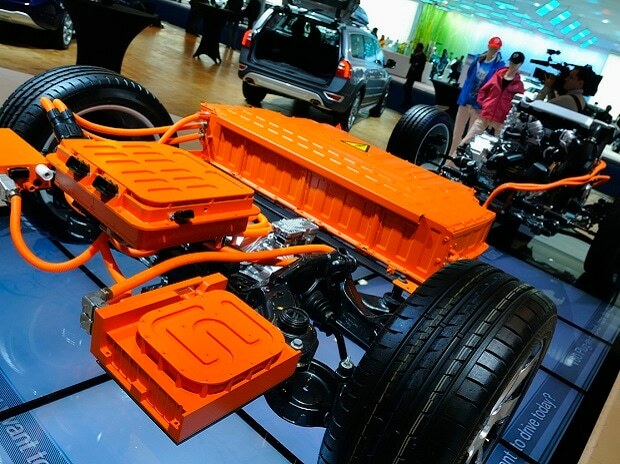 With Mahindra following the global standard practice of keeping a platform on the market for six-10 years, building them to be compatible with electric drivetrains now will help it compete when EVs become more mainstream. While its e2o light-weight electric car hasn’t seen too many takers, it continues to believe in the future of electric and is making big investments. Part of Mahindra’s optimism is due to the fact that the government is finally pushing for electric vehicles in India, and is not only setting lofty goals but is also working on laying the groundwork. By tightening the belt on emissions of gasoline-powered vehicles, the country is forcing manufacturers to look at alternatives such as electric and hybrid technologies. The FAME scheme, even though it failed to get too many OEMs on board, looked at standardising drivetrain components and charging infrastructure across manufacturers in order to lower costs. “I would have been much happier if more manufacturers had joined because it would have helped the entire industry, but we are individually doing everything anyway,” said Babu. Experts say that the future of electric mobility in India is looking bright because of a series of things falling into place. As the cost of energy produced through solar comes down, the government has seen a lot of merit in electric mobility since it will help cut oil imports. Further, technological advancements mean electric cars can be charged faster, have better range and the batteries that power them have a much longer life. More importantly, the cost of lithium ion cells has fallen by 70 per cent since 2008 and continues to fall even further. In Tesla’s $100,000 Model S supercar, the lithium ion battery pack makes up close to half its cost, so for affordable electric cars to become a reality, the world needs affordable batteries first. For Mahindra, this has meant that its electric mobility plan has taken a slight twist. “Our earlier intention of making our own (Mahindra Electric) electric vehicles is getting slightly shifted. We are now saying that we will electrify products, for which we are working with the Mahindra Group. They know how to make vehicles and we know what electricity and mobility solutions are,” Babu said.